Click the Change Language and Input Settings link at the bottom of the dialog box. The Languages and Input dialog box appears, as shown in this figure. The language you selected when setting up your device appears in the Languages pane on the left side of the dialog box. To change the language, click the Add button at the bottom of that pane. The Add Language dialog box appears. Select the language you desire from the drop-down list of available languages. The language you selected is added to the list of languages in the Languages pane. Click the newly added language to highlight it. A list of options appears in the right pane of the Languages and Input dialog box. In the Input Method section, check the box for the desired keyboard(s). 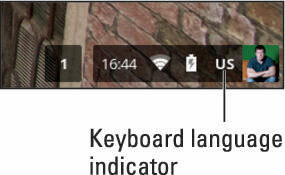 You know that you successfully added another keyboard language if a language indicator appears in your status area in the lower-right corner of the screen, as shown. You can activate your newly-added keyboard by following these steps. Click the status area in the lower-right of your desktop. Click the keyboard option located at the top of the panel. A menu of available keyboards appears. Click the desired keyboard language. 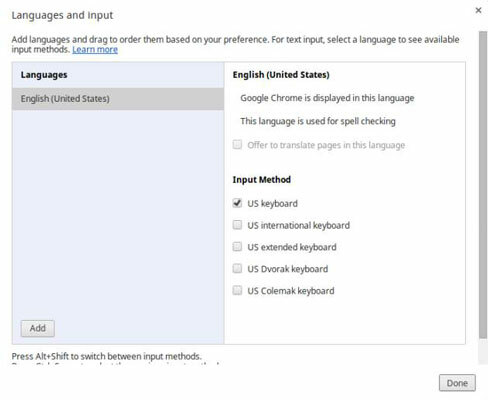 After you switch your keyboard, you'll notice as you type that your keys have changed to the standard for the language and country you selected. Change your language by repeating the preceding steps.